← Supermarkets everywhere but can you find a source? Looks like Stevie Lansdown and his football club Chief Exec, Colin Sexstone might just have gone and hoisted themselves with their own petard or, at least, from their 30 foot high billboard. Today’s revelation from Jones the News that Tesco have pulled the plug on the £20m Ashton Gate supermarket deal means there’s no longer a food store in the equation. Does that mean no stadium as well? It’s not looking good for Lansdown, who’s still ploughing on with his planning application for a major supermarket on the stadium site even though it seems doomed to failure. It’s an open secret that this application stands no chance in planning terms and relies, instead, on being backed on the basis of the £20m contribution it could provide to the new stadium as an’enabling development’. Alas, with no Tesco, there’s no £20m on the table and therefore no ‘enabling development’ argument to make any more. And forget the people clutching at straws claiming Sainsbury’s are ready to step in, move across the road and save the day. They might well be vaguely interested in the site but they won’t be paying top whack for it. And certainly not the £20m quoted. Why would they? With their chief competitor publicly stating their lack of interest, the huge price tag attached to the site has collapsed. Lansdown will be lucky to get £10m for it now. 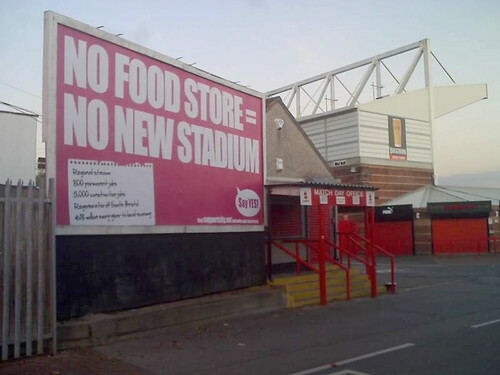 An Ashton Gate food store as ‘enabling development’ for a new stadium appears to be no more. Is it time for plan B? This entry was posted in Bedminster, Bristol, Bristol South, Developments, Local government, Planning, Politics, Southville, World Cup 2018 and tagged Ashton Gate, Bristol City FC, Colin Sexstone, Jones the News, Sainsburys, Stevie Lansdown, Tesco. Bookmark the permalink. 2 Responses to No food store = no stadium? Just so there’s no confusion, the club did tell me they are pushing ahead with plans to build a food store on the site, and are in negotiations about it. It’s obvious that Stevie L don’t care because he is out in africe for 3 weeks shooting endangered species. NB: the shooting bit isn’t verified!